Any kind of yarn, in any color, and any style of stockings are accepted. Try and get them around 6 inches in length. I use this pattern and crochet in the round to just 6 inches long including the top. Here is a link to a scalloped trim if you want to add it. I also add a little loop for hanging but it's not required. 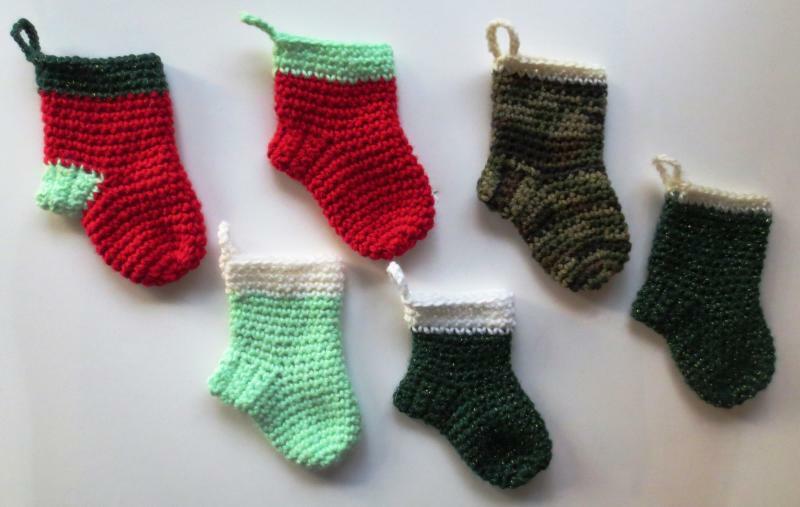 I crocheted one stocking and sewed the other 3. Are these good enough to send? I thought I might make some out of blue jeans too. Would that be okay? Those stockings are wonderful and will be happily accepted. I have done recycled denim ones is the past and are totally okay too. Here is the link to the denim sock tutorial. Thank you so much for helping! I crocheted around two of them. There's got to be an easier way to poke hole to crochet through. Does anyone have any tricks I can use?I'll take pictures of the two and post later. I really like the look but way to hard on the hand. I have a total of 8 cut out and 6 done. Try using a knitting needle to poke the holes. Also use a thimble on your fingers does help. If you want just glue a fringe or lace around the top edge and don't do the crocheted trim. Anything will be fine and don't do an edging that is hard on you. We want it to be enjoyable and not painful. 50 went out in the mail today. Wow they are really cool. 50 Holy smokes That's awesome!! Must say those are wonderful!!! Sandra, Josh was in a unit from your hometown when he deployed in 2007-2008 Crochetville was wonderful at blessing them with so many things that year! 50! Oh My!! So excited that you made that many stockings for the drive. I am so happy that you have helped out the Warmth for Warriors in such a grand way. Cindy I am glad you started this thread and inspired us to pitch in. I love seeing what we can do working together. This is one amazing group. You can always count on them to chip in, if needed. Thanks to all of you who are just amazing people that stepped up in such an wonderful way! Sitting her eworking on stockings, watching TV and listening to the rain from the tropical storm... Hugs! Sitting here working on stockings, watching TV and listening to the rain from the tropical storm... Hugs! Oh that is soooo wonderful that you are making stockings for the drive. Hope the storm wasn't too bad. Here are my little stockings, they look more like mini boots to me LOL.. I will mail them this week. I am working on the last one because 13 is not a very lucky number according to me. I got that pattern from Mary Jo. Easy & fast - one piece. Beautiful stocking's!! Love the fun fur on them. I thought about but forgot to ask if we could use that. Looks like we can and I just might crochet a few more with it. Thanks for reminding me. That thought never crossed my mind that "Fun Fur" might not be excepted??. I just thought it would be fine since I read here that even glue on lace would be Ok. I guess we better ask Cindy about that. If Fun Fur is not excepted I got some more work to do..!. That is: cutting off ALL the tops and replacing with regular yarn. I would hate to do that, but I would. I'm sure it's allowed if you can glue on lace. But Like you said I'm sure Cindy will be by to let us know for sure. 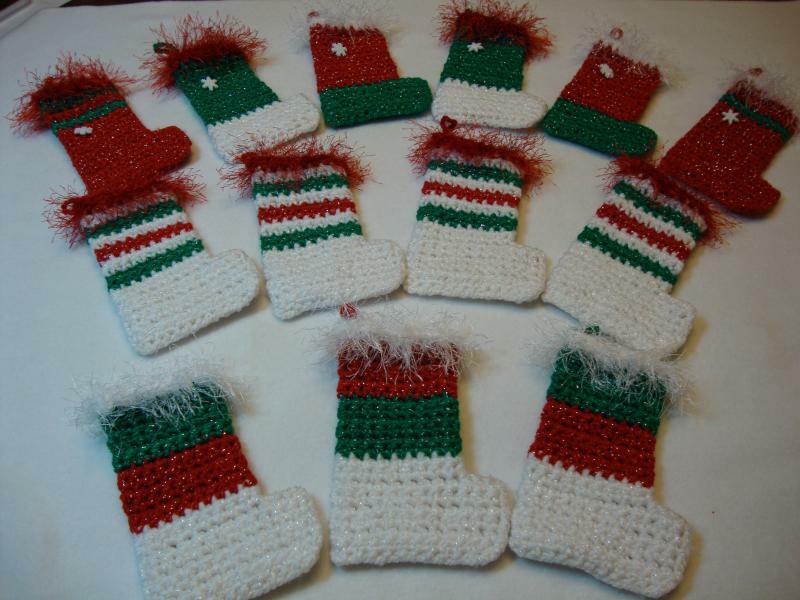 Fun fur yarn is fine to use and your stockings are just so adorable. I love the red, white and green together. Really anything is okay and don't worry about using something different at all. We love all the unique creations that are being made. Thank you so much for your contribution to the 2016 Christmas stocking drive. I am happy that Fun-Fur is OK:). Mary Jo, what color is that white with the flecks in it? I don't think I've seen that one yet here in our Walmarts. Those are so cute. Looks like a very quick work up pattern. If you are still interested you can find that yarn at Joann.com. This one is made by Bernat. I know that color of yarn, I have that at home. It is mostly white just once a while little red or green color. That dos look like little colorful "flecks/specks":). 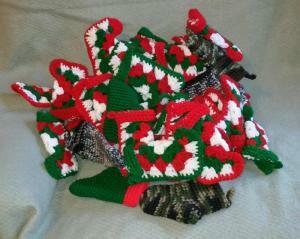 I finished up this batch of 6 stockings last night. All just scrap pieces of yarn I had in my Christmas yarn bag. I love this pattern as I can just do it from memory in less than an hour but I might look for another pattern just to try something new.